When you learn how to make Easter traditional recipes, you will find them in most countries which celebrate the holiday; especially for cakes, pies and other desserts. THE SLOVINEAN RECIPE FOR POTICA CAKE is traditionally made for holidays, festivals and special occasions. There are a variety of recipes with many different fillings. 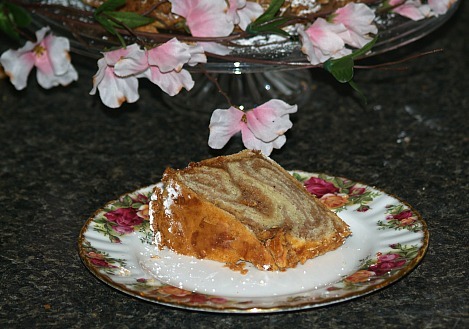 The taste of my recipe reminds me of my sister‘s Hungarian nut roll which I love. The main differences are that the two rolls of potica are baked together in a tube pan. There is also a taste difference due to the brown sugar which is in the filling of the potica cake. Combine butter and milk in saucepan and heat until butter melts; cool to warm. Mix yeast and lukewarm water(110 to 112 F degrees); add 1/2 cup of the flour and the sugar to yeast mixture. Sift remaining 2 cups of flour and salt together in mixing bowl. Stir yolks into slightly cooled milk mixture; add yeast mixture. Combine the liquid mixture with the sifted flour mixture; beat well and cover. Refrigerate dough overnight (it will be sticky). The next day preheat oven to 350F degrees; grease and flour an angel food tube pan. Mix nuts, brown sugar, cinnamon and milk to a paste. Beat egg whites until stiff gradually adding 1 cup of sugar; fold egg whites into nut paste. Roll out half of the dough into a 20 inch square on a well floured surface. Spread half of the filling over the dough and roll up like a jelly roll making sure seams are together. 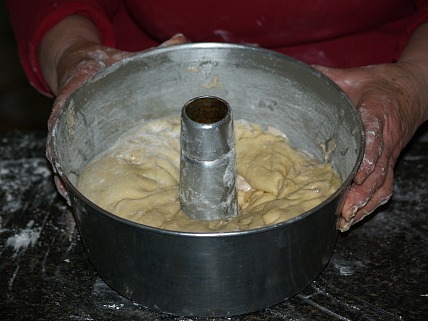 Place roll in prepared pan; proceed rolling and filling second half of remaining dough. Place second roll on top of the first roll in the same pan; let rise 45 minutes in a warm draft free place. Bake 15 minutes AT 350 F degrees; REDUCE OVEN TEMPERATURE to 325F degrees and bake 45 minutes longer. Cool 10 minutes and remove from pan; dust with powdered sugar before serving. Pictured Below: A piece of Slovenia's Easter Traditional recipe Potica. Learn how to make Easter traditional recipes from Greece which include this creamy delicious custard pie recipe. Phyllo dough recipes are very popular in the Greek cuisine. This very thin transparent sheet of dough is the flaky foundation of many desserts like baklava and this recipe. Place eggs and sugar in a large pan; beat with electric mixer on high until thick and lemon colored. Gradually beat in the farina and milk; cook over medium heat stirring until steamy about 8 minutes. Reduce heat to medium low; continue cooking and stirring until thickened (10 to 15 minutes longer). Remove from heat; stir in lemon peel, vanilla, nutmeg, salt and 2 tablespoons butter. Cover with plastic wrap, pressing plastic onto surface of custard; set aside. 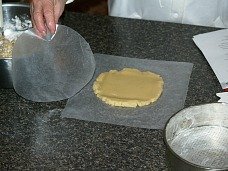 Unroll Phyllo dough and lay flat; cover with plastic wrap to prevent drying. Brush bottom and sides of a 10X15X2 inch roasting pan with some of the melted butter. 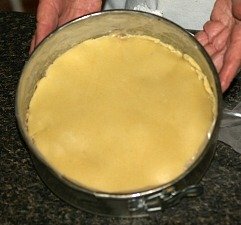 Place 1 sheet of Phyllo dough in the pan pressing edges to the sides; brush sheet with melted butter. Continue laying Phyllo sheets brushing each with butter until 2/3 of the dough has been used. Spread custard over the Phyllo in the pan; layer the remaining sheets brushing each with butter. With a sharp knife score top into 24 squares cutting through 3 or 4 layers. Bake until lightly browned about 45 minutes. To serve cut into squares and drizzle each piece with syrup. Cinnamon Syrup: Combine in a saucepan ½ cup sugar, 1/3 cup water, 1 tablespoon lemon juice and 1 cinnamon stick about 3 inches long. Bring to a boil stirring until sugar is dissolved; remove from the heat and let cool. 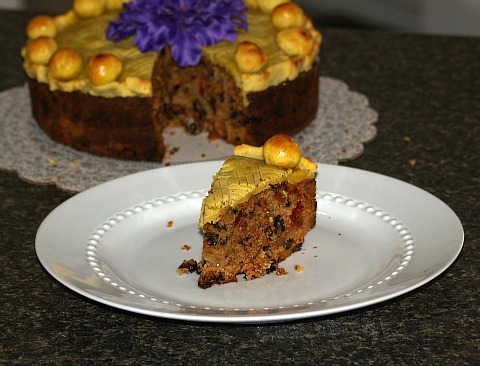 I learned how to make Easter traditional recipe from England include this very flavorful fruit cake recipe called simnel cake. Decorated, it makes a very pretty presentation for this special occasion. It is made with two layers of almond paste or marzipan. 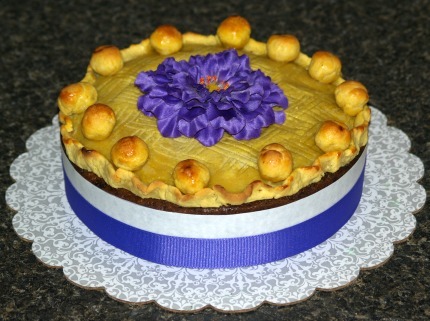 It is traditionally decorated with eleven or twelve marzipan balls representing the twelve apostles; in case of using eleven, it would be minus Judas. Grease an 8 inch spring form pan; line bottom and sides of pan with waxed paper and grease again. In a large bowl beat the butter and sugar until light and fluffy 7 to 8 minutes. Beat in the eggs one at a time beating well after each addition; blend in rum and orange juice. In another bowl combine and mix raisins, currants, cherries and mixed fruit. Sift flour, baking powder, cinnamon and allspice over fruit mixture; blend well. 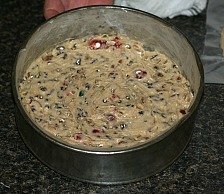 Fold flour fruit mixture into creamed mixture. 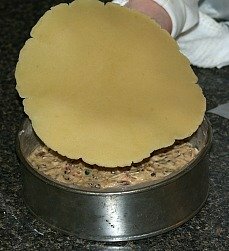 Place one can of almond paste between 2 sheets of waxed paper; roll out to an 8 inch circle. Spoon ½ of cake batter into prepared pan; place almond paste circle over the cake batter. Place remaining batter over the almond paste circle and smooth the top. Bake for 2 hours to 2 hours and 15 mintues until center springs back when lightly touched. Remove cake from the oven and cool to warm in pan on a wire rack. PREHEAT OVEN TEMPERATURE TO 425F degrees. 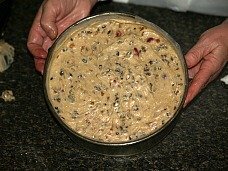 Remove cooled cake from pan; peel off lining and place cake on a small baking sheet. Place remaining another can of almond paste between 2 sheets of waxed paper and roll to an 8 inch circle. 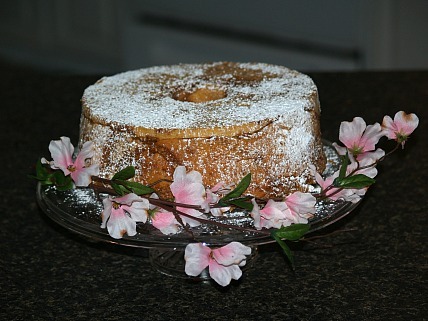 Brush top of cake with egg yolk glaze; place almond paste circle on top of cake and flute edge. Score almond paste with a blunt knife in a lattice design; brush top with egg yolk glaze. Top with 11 or 12 almond paste balls size of small marbles. Bake at 425F degrees for 10 to 12 minutes or until almond paste is slightly brown. Remove cake from baking sheet and cool completely on a wire rack. Place cake on a serving plate and decorate with flowers and ribbons. NOTE: I tint my top layer of almond paste and balls yellow about 6 to 7 drops of food coloring. If you use balls and they start to brown to quickly, cut a piece of foil with the center out and lay on top to cover the balls. Pictured Below: A piece of the English Easter Traditional recipe Simnel cake.